NEW DELHI: India is developing its own seeker technology for its missiles, with efforts from the state research and development agencies and the private sector. Once ready, this indigenous seeker technology could be integrated on the BRAHMOS supersonic cruise missile and other Indian missiles from the Defence Research and Development Organisation (DRDO) stable. 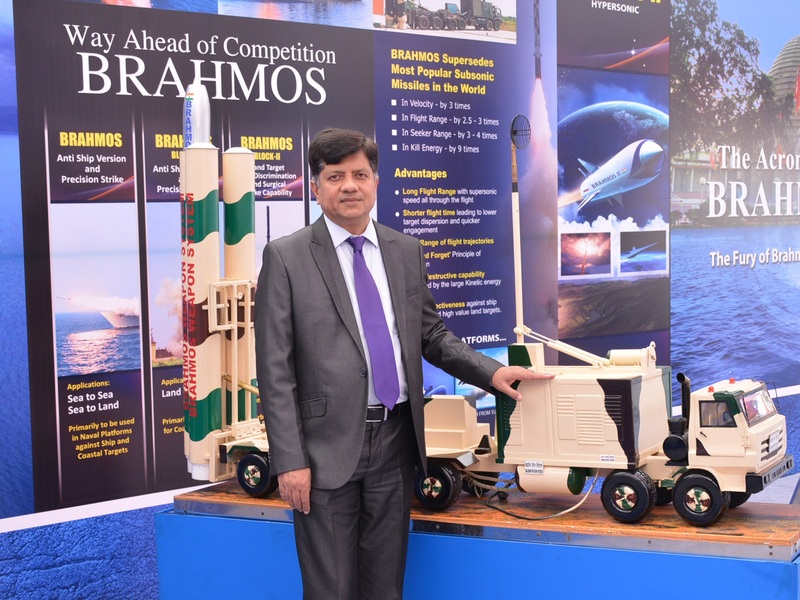 In the future, India will be able to use the indigenous seekers, on BRAHMOS too, though currently it uses the Russian seekers, BrahMos Aerospace Chief Executive Officer and Managing Director Sudhir Kumar Mishra told Arming India in an exclusive interview. A few private sector companies from India too are part of the efforts. Mishra said it is possible for India to have the capability in the future to produce the entire BRAHMOS system indigenously. He added that India learnt canisterisation of missiles know-how from Russia under the BrahMos cooperation. So far, we have been looking at making it supersonic. This JV has the capability to make cruise missiles, like nobody else in India. Now, could you become the production agency for other cruise missiles like what the DRDO is developing, like subsonic one? We are willing to expand our business plan. We would like to be known as a Missile company that makes subsonic to supersonic to hypersonic missiles. There are certain limitations in the light of the India-Russia inter-governmental agreement. If the Governments feel and they carry out certain amendments to the existing inter-governmental agreement, which is the guiding force behind this very successful project, then certainly we can. Have you made any such suggestion yet? No, we have not. But it is a dream to make subsonic to hypersonic. We would certainly like to do that. But I am not able to answer this precisely, as there are still so many gaps and some dark areas. We are certainly trying to overcome them. Maybe in the future, I would be in a position to answer that question. One more thing, you had asked about our future plans. We are already working on the hypersonic version. But hypersonic technologies are futuristic and are different from the existing engineering rules and laws, which may not be applicable at that speed. So we will have to come out with new engineering materials, new ruggedized electronics, different control and guidance laws, aerodynamics design, manufacturing process to meet the new material and new design requirements. These are the challenges that we face for hypersonic missile. BrahMos Aerospace, DRDO and NPOM, our Russian partner, are all working in this area. Dr. A. P. J. Abdul Kalam gave a very motivational slogan: You can't be second or third all the time and you have to be first someday in some technology. Some time ago, INFOSYS mentor Narayana Murthy commented that in the past 60-70 years, India has not made any breakthrough in science and technology. So, in developing a hypersonic BRAHMOS, we want to break that jinx, to overcome that jinx, and become the first in the world to develop a hypersonic cruise missile. It could be the biggest scientific breakthrough for India. And it has all the potential to become one. This hypersonic BRAHMOS missile requirement, has this been conveyed by the services? What happens is the Services have their aspirations and the Engineers have their dreams and competence to think of the future to offer concepts, products, capabilities and competencies to the users. Both cannot imagine in a vacuum. There has to be a basis. Right now, they cannot propose something that is still on the paper. Hypersonic technology is not even on the paper. It is still in the minds of the scientists. It is still an evolving technology. The forces say, if you offer a hypersonic missile, we will take it. The day we achieve that the users will surely grab that. You talked about the steep dive BRAHMOS which can be operated through different guidance software. How much of it is Indian? Lots of software, all ground systems, support systems, guidance software are ours. But mission software is theirs. We are completely embedded into their software. The seeker technology, is that Russian? BrahMos is a joint venture and Russians hold 49.5 per cent of the equity. When we signed the inter-governmental agreement, it was agreed that the engine and the seekers are going to be the work share of Russia. Rest of the work share will be India's. Because of this reason, we are still using the seeker built by Russians. At the same time, BrahMos, DRDO and several other private companies in India have initiated work on developing a seeker. I would like to give you the names of Data-Patterns from Chennai, Alpha Design Technologies from Bangalore and ECIL. They are developing the seeker technology. DRDO is also working on this technology. In future, we will be able to use this seeker in our BRAHMOS. There is one more factor we should consider -- the Russian side would also like to keep some business with them. If we talk about 100 per cent indigenisation, then it would not remain a joint venture. It would become a completely Indian company. It is not in the right spirit of partnership that you grab all businesses and leave your partner high and dry. When the Indian entities develop the seeker, would you be able to use this India-made seeker? In the given format, will you be able to use it? Maybe in 2-3 years. They are now developing it. Russians have agreed that if the design and development cost of the seeker by the Indian companies is low, they will also take it. Now, the business is commercial in nature. The world has moved away from ownership to economic benefits. Do these companies have a Russian collaboration? They are developing in collaboration with DRDO and BrahMos. The seeker technology indigenisation, please tell us more about it. Did you approach the Indian companies or they did it suo moto? We adopted two approaches. First, we gave a contract to ECIL and Data Patterns for the new kind of RF SCAN seekers and they are working along with DRDO to do the design, development and testing. Under the second approach, Data Patterns and Alpha Design, both said that they can undertake development of RF Mono Pulse seeker in 'No Cost, No Commitment' model and if they develop a seeker, then I should replace the existing seeker with their seeker. These are the two models. Right now, we are using a RF Mono Pulse seeker and hence if they come up with it, we can replace the seeker today itself. But the RF SCAN seeker is futuristic. With the seeker technology, BrahMos and DRDO are helping the Indian entities. Can this be used in other missiles also or is it specific to cruise missiles? The seekers are used in the terminal, homing stage of the flight. So, it can be used in any kind of missiles. When you are targeting, you are using the seeker in the last 50 or 100 seconds of your flight. Whether it is BRAHMOS or any missile. So, the seeker can be used in any missile. Will we continue to be dependent on Russia for engines for BRAHMOS? There is no question of being dependent on Indian or Russian vendors. This is a JV and we need to give some business to Russians. As per the inter-governmental agreement, engine is the work share of the Russians and we will be using the Russian engines. We will continue to use the Russian engines. There is no harm, as we never faced any discrimination or capability degradation. Have you learned to make the engines? It is a matter of trust. What they get from us, they don't reopen and what we get from them, we don't reopen. What have you learnt from this BrahMos experience that you had not as DRDO scientist? We learned many things through this JV. The first thing I would like to tell you is the canisterised system of missiles, which were not available in India. We took up a project to indigenise and indigenously develop canister for BRAHMOS missile, and this was meant only for the BRAHMOS. But a variant of this canister has been used in the Agni-I's canisterisation as well. That's a technological benefit from the JV. Whatever guidance system has been used in BRAHMOS is also being used in other missile systems. We have created a manufacturing capability in the country and this eco-system is able to support other missiles too. BrahMos is the first unique JV in which we designed and developed a whole weapon system - a ground system, command and control, missile and other components. This experience has percolated to other DRDO projects as well. We learnt a lot from this JV project. Will you have the capability in the future to develop and use the entire BRAHMOS system within India? Yes, I believe in the future, one day, we will have the capability to completely manufacture BRAHMOS using Indian work share. Again, I reiterate that it will not be in the right spirit of partnership. The seeker we are developing can be used in BRAHMOS and other missile systems as well. Soon, the warhead will also get Indian work share. We have already conducted the tests and are waiting for their concurrence. Soon, I feel within a year or one-and-half years, we should be able do it.